An efficient and easy route towards triazolinedione (TAD) endcapped peptides is described, in which a TAD-precursor was coupled to N-terminal amines on a solid support. Modified peptides readily reacted with diene end-functionalized poly(ε-caprolactone) of different molecular weights. The ligation proved to be orthogonal to a variety of functional groups present in natural amino acids. Herein, we report the synthesis of triazolinediones on a solid support. A urazole moiety is built up from N-terminal amines of peptides, as shown in Fig. 1. The functionalization is performed via two steps starting from the amine. After cleavage from the resin, TAD is formed by oxidation, which readily reacts with dienes that are present in e.g. 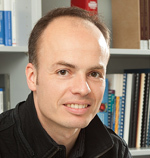 diene-endcapped PCL. 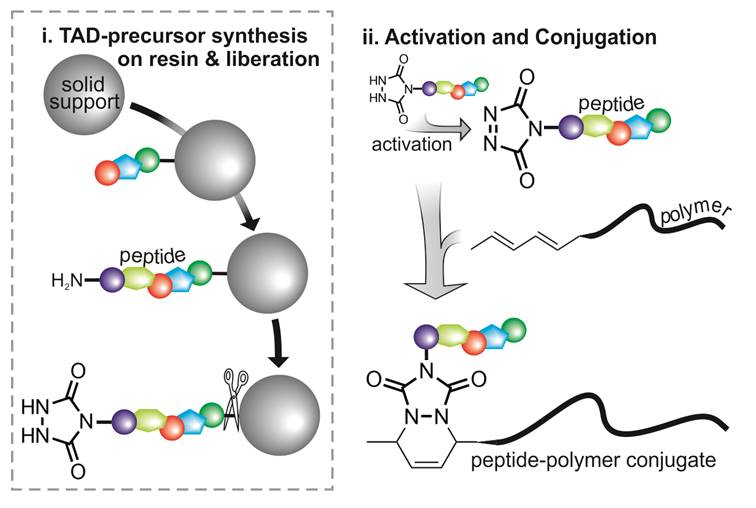 This approach offers an easy and fast access to peptide–polymer conjugates via chemoselective TAD–diene ligation.